Japanese firm Suzuki Motor has developed a patent-pending PP resin said to be able to lightweight vehicles by 10% than the current PP with better colouring. Called the Suzuki Super Polypropylene (SSPP), the material is used to make the front bumper of the Escudo that was launched in Japan this July. SSPP is said to satisfy both rigidity and impact resistance requirements by adding only styrene thermoplastic elastomers to the high rigidity base PP resin without adding talc. In order to satisfy both rigidity and impact resistance, the mainstream of the current resin adds rubber and inorganic filler material such as talc to its base PP resin. The talc was the main factor of increasing weight and colour-dulling due to degradation of transparency. Compared to other PP, flexural rigidity of the SSPP is the same while lessening weight due to talc-free base PP resin. When compared with parts of the same size, parts using SSPP are 10% lighter. 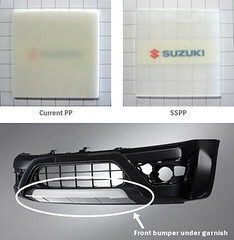 In the future, Suzuki plans to use more SSPP to the interior and exterior parts of bumpers. The front bumper of the Escudo has a brigher silver metallic colour without painting due to the high colourability of SSPP, says Suzuki. Because it has no paint layer, in case of scratches such as stone chips, it is difficult to distinguish a scratch. It can also reduce environmental load because it does not emit volatile organic compounds (VOCs). Suzuki says it will expand the usage of SSPP to the interior parts in the future.